Dancers: Jonah Bokaer, James McGinn, Valda Setterfield, Meg Harper, Catherine Miller. Photo taken at Arnolfini in Bristol, courtesy of: Ariane and Seth Harrison, Harrison Atelier (HAt), 2010. Jonah Bokaer’s new dance work, Anchises, is a subtle reminder of how navel-gazing and ego-driven our daily lives can be. The cast mixes older (Valda Setterfield and Meg Harper) and younger dancers (Catherine Miller, James McGinn, and Bokaer). They frequently pair off, one older and one younger, prodding, leaning, and teasing one another gently. There is a great sense of familarity, respect, and devotion between generations, where a tender touch can be as moving as when Bokaer carries Setterfield across the stage. In a recent New York Times article, Bokaer cited as a point of inspiration how he and another dancer carried Merce Cunningham down the studio’s stairs during a blackout, in addition to the story from Greek mythology about Aeneas carrying his father, Anchises, out of a burning Troy. It’s a distant cry from so much of what we see in small dance venues. 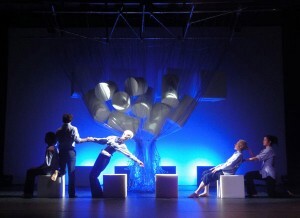 The design firm Harrison Atelier created the intriguing, functional set, featuring gray foam cubes scattered on the floor, and white foam cylinders suspended in a cluster of plastic tubing; the cylinders are released to become additional props and furniture that the dancers sit on or move about. In fact, so much time is performing the task of moving the blocks that it evokes Judson, where any movement can be choreography. The dancier movement eschews virtuosic technique in favor of simple passages in which geometrical poses alternate with brisk lunges or tilts. In a duet between Miller and McGinn and a solo for Bokaer, the tempo quickens and the dancers eat up space more rapidly. Yet the dynamic is consistently gentle. Loren Dempster created the ebbing and flowing score, performed live in the pit. Bokaer taps his roots as a Merce Cunningham dancer in Anchises, at Abrons Art Center through Nov 21. Setterfield and Harper are also Cunningham alum, and it is a treat to watch them move with the serenity and elegance that seems part of Merce’s legacy. Setterfield, with her magnetic presence, has never been less than riveting in the countless performances I’ve seen her in. She becomes a sort of shaman figure here, finally presiding over the neatly arrayed council like over the Last Supper. The enterprise is lit by Aaron Copp in brilliant schemes of ice blue and peach, evocative of Robert Wilson, for whom Bokaer has choreographed in recent years.